(Nanowerk News) Healing of burn wounds requires that dead tissue is removed and new skin tissue is regenerated, while ensuring that the wound is closed rapidly to minimize the risk of infection and scar formation. A*STAR researchers now report non-immunogenic and non-cytotoxic hydrogels composed of nanofibrous peptide assemblies, which expedite wound closure and promotes epithelial and dermal regeneration almost twice as fast as existing wound dressings ("Ultrashort peptide nanofibrous hydrogels for the acceleration of healing of burn wounds"). Current methods of burn care, which include gauzes, hydrogels, hydrocolloids, foams and films made from natural or synthetic materials, are in need of improvement. Mepitel, for example, is a silicone-coated polymeric net, which maintains gaseous permeability to the wound but not the hydrated environment required for healing. 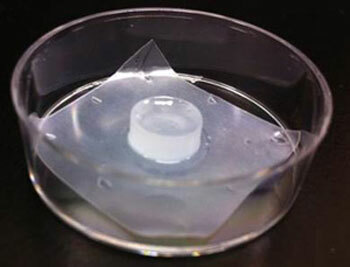 Charlotte Hauser and colleagues at the A*STAR Institute of Bioengineering and Nanotechnology in Singapore show that the nanofibrous hydrogels, composed of assemblies of short and easy-to-synthesize peptides, effectively promote in vivo wound healing. The transparency of the hydrogel allows the wound to be observed during the recovery process. This moisture-rich environment stimulates the removal of dead tissue in a process termed autolytic debridement. Encouragingly, the hydrogel-treated wounds show autolytic debridement on day 8, whereas for Mepitel-treated wounds it is not observed until day 10. The knock-on effect of this enhanced tissue removal is that the hydrogel-treated wounds close faster. By day 14, the researchers noted almost complete regeneration of the epidermal layer for the hydrogel-treated group and also observed the presence of precursors for the formation of hair follicles. Hauser and colleagues aim to investigate if other therapies could be combined with the hydrogels, such as the addition of compounds — for example anti-infectious drugs — to further speed up wound closure.